Duane is a Principal and Co-Lead of the Financial Services vertical. Duane focuses on growing clients’ top and bottom lines by defining, implementing and institutionalizing growth opportunities and operational efficiencies. He is particularly skilled at measuring and communicating the value of investments by building stakeholder alignment capable of influencing culture and achieving business objectives. Duane brings nearly 20 years of management consulting and financial services industry experience. Prior to joining Liberty, Duane led the Information Technology Strategic Planning function at TransUnion. He began his career of advising clients and delivering high impact solutions at both Accenture and Diamond Management and Technology Consultants. Duane joined Liberty to advise, to collaborate with and to delight clients. As calendars turn to July and August, thoughts often turn to summer weather, baseball games and weekend getaways. However, in the hearts and minds of executives, this time of year also signals the commencement of another annual planning cycle. 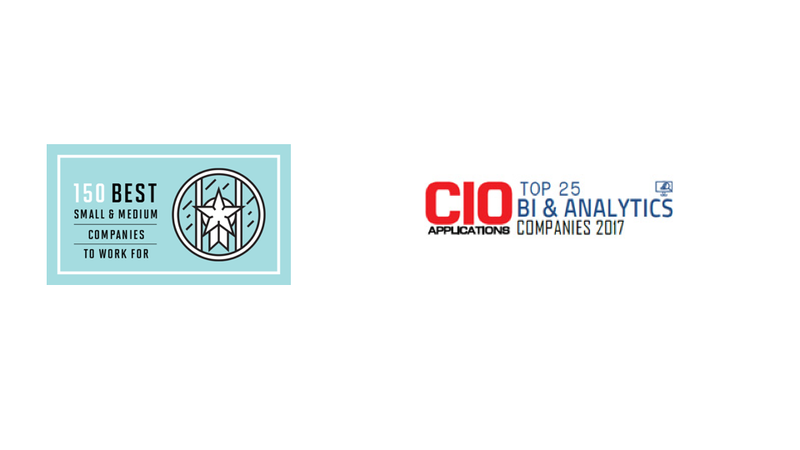 For CIOs, and other information technology executives, annual planning requires the creation of a plan for the coming calendar year, reflecting key initiatives and spend levels for information technology investments. The annual plan is a practical, calendar year implementation of the IT strategic plan, assuming such a strategic plan exists in a given organization. According to Corporate Executive Board, 93% percent of IT’s business partners agree that IT strategic planning is important in achieving their business objectives. However, less than 25% rate IT’s strategy and planning efforts as effective. Given this dismal appraisal of the value delivered by strategic planning, is annual planning then a wasted endeavor? Is annual planning doomed to drain precious organizational capacity and deliver limited to no value in return? We believe that annual planning has a value driving purpose within information technology organizations. However, value must be unlocked. Value is delivered first through the development of a culture and common vocabulary for strategic planning. Then, incremental streams of value are unlocked through attainment of subsequent levels of the Annual Planning Maturity Model. For organizations to embark on effective annual planning, a language must be in place to describe the scope of the plan and the annual planning process itself. For example, if an organization wishes to plan its large discretionary projects for the coming year, the terms “project” and “discretionary” must be defined and understood. Many organizations find value in segmenting work to run the business from work to grow and transform the business. This allows initial planning efforts to avoid “boiling the ocean” and it enables focus on what the organization wishes to (and can) control in the coming year. Frameworks such as Gartner’s Run, Grow and Transform Model may be one asset for introducing the language required for planning and scope definition. Once a language for planning is understood, cultural acceptance must ensue for the foundation for effective annual planning to be in place. Often, key members of organizations view annual planning as unnecessary. Based on the 25% success rating for strategic planning as measured by Corporate Executive Board, this perspective is understandable. However, to harvest value from annual planning processes, the organization must not passively resist it. Examples of passive resistance may include delayed response time to planning requests or failing to make resources available to participate in the planning process. Looking into the coming year, even for a narrow scope, takes broad organizational perspective and a cultural willingness to participate. Here, a strong executive champion for the planning process plays a key role. This champion sets the vision for the annual plan, defines the need and business objectives, articulates the value expected and drives cultural alignment. For many organizations, the journey toward harvesting value from annual planning begins with planning large discretionary projects for the following year. These are typically the efforts that change or transform the business in a meaningful way. Examples may include introducing a new product category or entering a new business through acquisition. Planning for large discretionary projects enables business expectations to be set and financial needs and impacts to be clearly understood and communicated. This phase of annual planning maturity requires that business project demand be captured and prioritized. This phase also requires that organizational resources be allocated to those projects worthy of execution in the coming year. Engagement with the business is a critical first step in planning for discretionary projects for the coming year. Technology planning teams must understand what the business wants to achieve and roughly how much investment is available to meet those needs. Investment is best measured in consumption of existing capital and resource capacity. Any new or incremental capacity funded by the business must also be considered. Once the demand from the business is understood, the technology planning team can allocate its available resources (capital and people) against the demand to assess potential capacity constraints. Most often, there is not sufficient capacity to meet all of the business demand for discretionary investment in the coming year. Prioritization is then required to align the demand with the available capacity. Prioritization requires business and technology leadership to agree upon the criteria to make trade-offs and prioritization decisions. Common criteria include alignment to business strategy, financial impact (such as Net Present Value or Payback Period) and risk. Risk involves the business risk associated with the investment assumptions and the technology risk of unsuccessful delivery. While planning for large discretionary projects provides some value, this level of annual planning maturity provides visibility into only a subset of IT resource consumption for the coming year. It also relies on high-level assumptions surrounding capacity for investment. Finally, the annual planning artifact produced may quickly become stale as business conditions change into the new year. The next phase of annual planning maturity provides for a holistic plan for the IT organization in the coming year. Here, the planning team captures all demand for IT resources, not just the demand for large discretionary projects. This remaining demand can best be thought of as the Run and Grow portions of Gartner’s Run, Grow and Transform Model. Capital investments are also considered here. Run demand refers to those activities (and resulting resource demand) for keeping the lights on. This includes functions such as production incident management. Grow demand refers to small, incremental change efforts. This encapsulates efforts such as adding a new product feature. Capital investments refer to the planned refresh of infrastructure and the acquisition of new technology assets. It may at first seem that capturing Run and Grow demand is detailed and time intensive. This does not need to be the case. Organizations can leverage time tracking data or benchmarks to allocate a percentage of capacity to these activities. The percentage allocated typically varies by team. Some technology teams, such as the network operations center, spend nearly all of their time on Run / Keep the Lights On activities. Other teams spend less. Leveraging time tracking data from the prior year, or industry benchmarks by team, enables a fairly strong projection of the capacity that will be consumed by these activities. This will enable better visibility into the remaining capacity. That is, the capacity truly available for discretionary investment. In order to allocate teams effectively to Run and Grow demand, the concept of team must be clear. Organizations often have a human resources view and a financial view of the concept of team. The optimal view selected should group resources having similar skills. Grouping in this fashion supports more granular allocation of resources to discretionary investments as well. Through this exercise, confidence in the plan is increased and the usefulness of the plan to identify resource (or capability) shortfalls grows tremendously. At this phase of maturity, the plan has become quite useful in forecasting demand for the coming year. Supply constraints are identified, and a strategic asset has been created. However, unless the plan is operationalized, this usefulness fades very quickly. Now that the annual planning process produces an asset that delivers value, it is imperative that it be operationalized. Specifically, the plan must evolve into a living document. A living plan is one that is updated periodically throughout the new year. Most organizations find that a quarterly cadence is sufficient for keeping the plan current. However, some organizations prefer monthly updates that align with the publication of revised financial forecasts. It is key that the update process be kept light, especially in its early years. A leading practice is to focus only on capturing changes from the prior plan of record. The technology planning team then integrates those changes to create a new master plan. The planning team further assesses variances and drives requested changes down to their underlying business catalyst. This process can lead to deep insight. For example, have business conditions changed? Were estimates of pace and progress for initiatives systemically inaccurate? Can other risks to the plan now be detected that were previously undetectable? While operationalizing the plan maintains the value achieved in phase 2 and reveals new insights, this phase of planning still leaves value on the table. For annual planning to reach its pinnacle, the plan must be capable of informing strategic decisions. 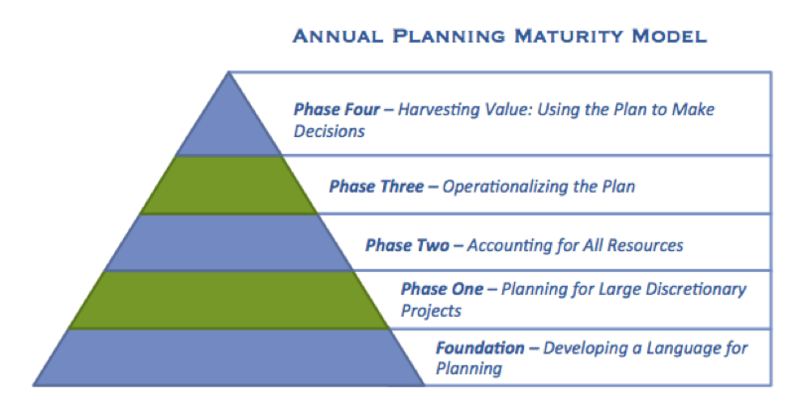 With the plan asset representing all of IT spend and kept current through operationalization, we are ready to arrive at the pinnacle of the Annual Planning Maturity Model. In this phase, the plan is leveraged to make strategic decisions. The annual plan asset can be leveraged in the enterprise portfolio management function to yield immediate value. Enterprise Portfolio Management is responsible for the ongoing demand management process. The presence of a current plan representing the utilization of IT resources provides decision makers with critical visibility and impact analysis when business conditions change or opportunities arise that result in the need for quick and responsive IT initiatives. For example, if the business wishes to enter a new market, the plan can indicate the resource availability for, and prioritization implications of, doing so. The annual plan also can serve as a valuable risk management tool for the Program Management Office. Since the annual plan shows the expected consumption of resources by project by month (or week), the Program Management Office can track actuals against these projections. Excess consumption of resources could signal delivery challenges. Under consumption of resources could signal the risk of missing delivery dates and / or disappointing business stakeholders. The annual plan can also provide early warnings and increased visibility for Finance. For example, projects consuming materially more or less resources than planned can signal impacts to software capitalization projections and quarterly financials. At this point in the annual planning maturity model, the plan is used to make forward-looking decisions and provide critical, advanced visibility into areas of risk. Beyond the common uses presented here, your organization may uncover additional opportunities to harvest value from the annual plan. Have questions about your business transformation?